The UAE managed security services (MSS) market is at the initial stage of its life cycle and is expected to gain momentum over the forecast period owing to several developments in UAE as a part of the Dubai Smart City Initiative, Vision 2021, and Emirates Blockchain Strategy 2021. Additionally, rising cyber-attack incidents over the past few years along with increasing digitalization in several sectors would also act as a major driver for the adoption of managed security services in UAE. According to 6Wresearch, UAE managed security services market size is projected to grow at a CAGR of over 13.6% during 2018-24. The Security Assets Monitoring & Management (SAMM) Service type occupied the maximum revenue share in the overall UAE MSS market in 2017 owing to increasing role of digitalization across several enterprises, including cloud migration, software defined networks (SDN) and Internet of Things (IoT). Further, on account of rapid infrastructure development in the country and the need to monitor the growing data volumes in real time, the demand for SAMM service would increase in the coming years. The banking, financial services & insurance application market accounted for the highest UAE managed security services market share due to higher probability of cyber threats in the banking sector. Banking organizations hold confidential data of multiple customers which is a common target for many cyber crimes. Therefore, the use of managed security services in the BFSI sector becomes necessary. Additionally, several government compliances make it mandatory for companies in the energy domain to adopt MSS for managing their routine activities. The UAE managed security services market report thoroughly covers the UAE managed security services market by services, types, sectors, and regions. 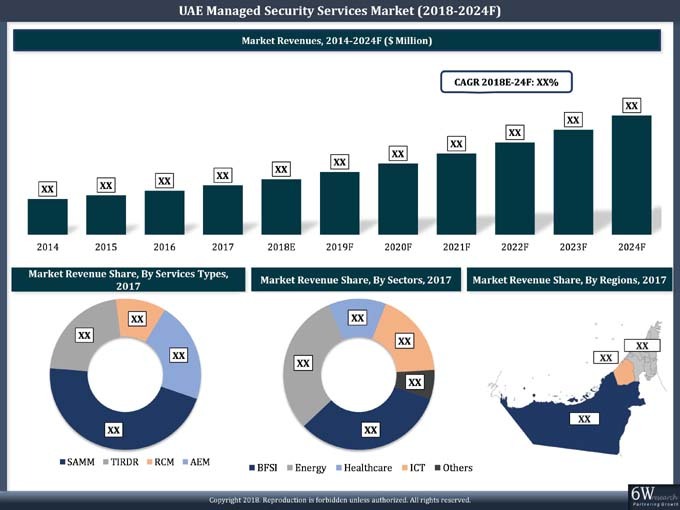 The UAE managed security services market outlook report provides an unbiased and detailed analysis of the UAE managed security services market trends, opportunities/high growth areas and market drivers which would help the stakeholders to device and align their market strategies according to the current and future market dynamics. •	Historical data of Global Managed Security Services Market during 2014-2017. •	UAE Managed Security Services Market Size & UAE Managed Security Services Market Forecast until 2024.